Purchasing this product will earn you 105 Greenbucks! 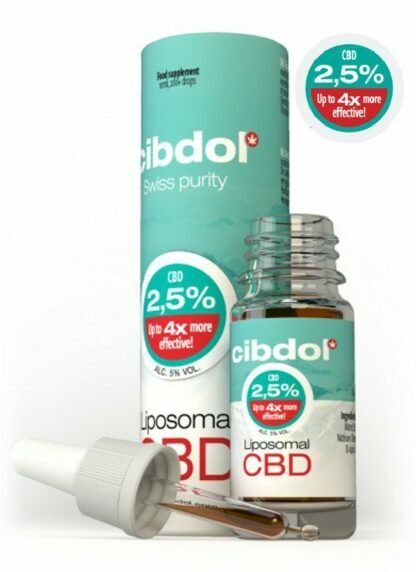 Cibdol Liposomal CBD 250mg 10ml is a liposomal formula that amplifies the already substantial effect of hemp-derived CBD, providing lasting relief when you need it the most. The combination of liposomes with a small percentage of alcohol allows CBD to be four times more effective than other oils as it is absorbed directly into the bloodstream. This also results in a quicker onset of effects that last considerably longer, making the formula ideal for anyone seeking an immediate lift. CBD advocates may be skeptical of the lower concentration of this product, however, due to the innovative formula, our 2.5% Liposomal CBD Oil is comparable to our traditional 10% CBD Oil. This higher dosage of CBD delivered to the bloodstream is the driving force behind this increased effectiveness. CO2 extraction is the cleanest way to harness CBD from the hemp plant. It produces a rich, potent concentrate that preserves as many of the plant’s natural compounds as possible. Hence, all our CBD products derive from full-spectrum CO2 extraction, retaining rich concentrations of cannabinoids and terpenes. When ingested, these chemicals synergise to offer a plethora of therapeutic benefits. CBD or Cannabidiol is one of over 100 compounds found in cannabis that belong to a class of molecules called cannabinoids. Of these compounds, CBD and THC are usually present in the highest concentrations and therefore the most recognised and studied. The form of cannabis we use for our CBD oils is industrial hemp, with practically no THC. Our Liposomal CBD has high levels of CBD and virtually no THC (<0.05%). CBD is a non-psychoactive cannabinoid with numerous reported medicinal benefits. Typically, Hemp/CBD is poorly absorbed when taken orally. In liposomal CBD products, the hemp oil has been encapsulated in microscopic liposomes which significantly increase the absorption and bioavailability of the product, which enables the CBD to be delivered directly into the cell. A liposome is a nano-sized bubble or sphere (vesicle) made from a phospholipid (in many cases phosphatidylcholine, the same substance found in our cell membranes). Liposomal encapsulation is a process that fills these bubbles with hydrophobic or hydrophilic substances such as Vitamin C, Glutathione or CBD. Liposomal Encapsulation Technology provides a very effective method of bypassing the destructive elements of the gastric system and aiding the encapsulated nutrient to be delivered to the cells and tissues. Keep in a cool, dark and dry place like a refrigerator. Use 2 months after opening. Take 3 – 4 drops two to three times a day.